ORV 989 is another in the long line of Portsmouth buses with the registration numbers in the ‘high 900’ series. 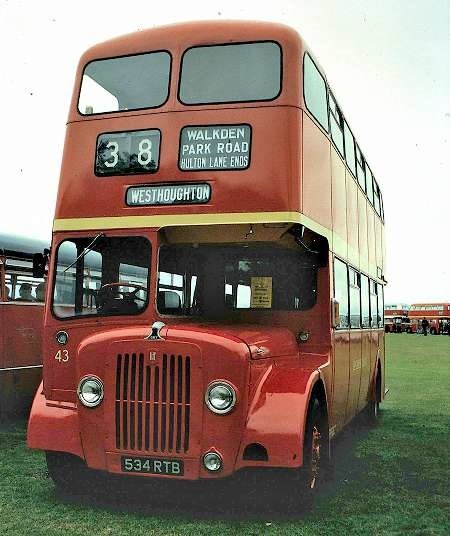 It dates from 1958 and is a Leyland Titan PD2/40 with Metropolitan Cammell H56R body. It is seen in the St Catherine’s park and ride car park during the King Alfred running day on 1 January 2009. 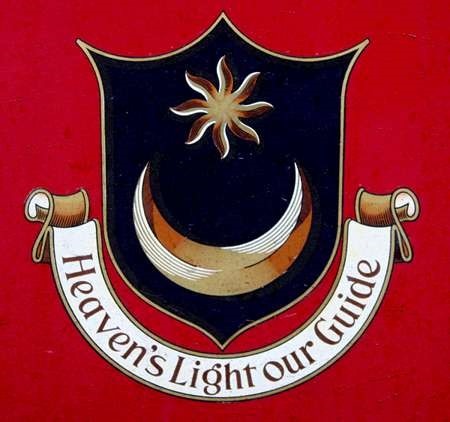 This second view shows the Municipal Crest. What a nice Christmas Day sight! 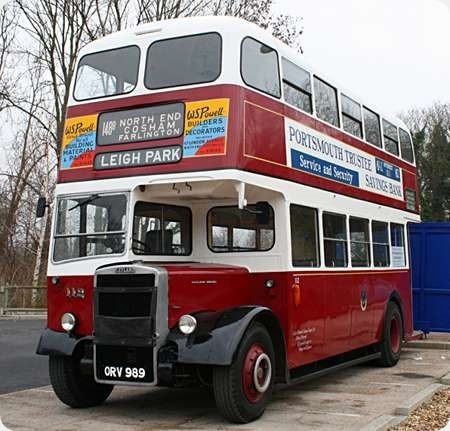 This bus is a superb example of restoration as not only does it look smart but it looks "real", in other words like a Portsmouth bus would have done at the time. I think the adverts play no small part in this and of course they are not appropriate for every restoration. Thank you, David. I must say, having seen other versions of Portsmouth’s livery, the others were nowhere near in the "elegance" department. Drop windows on an Orion, was this a design feature unique to Portsmouth? All our PD2s with Orion bodies had half drops. Although looking like a Birmingham ‘Standard’, this is one of a pair of unique vehicles ordered in 1952 – the other, 3001 – being a Guy Arab with Saunders Roe body. Both built to a ‘lightweight’ design, the chassis of 3002 was manufactured as a chromium plated exhibit for the 1952 Commercial Motor Show. During the following two years it received its Metro-Cammell body which became a ‘model’ for the ‘Orion’ and with unique manufacturing differences. 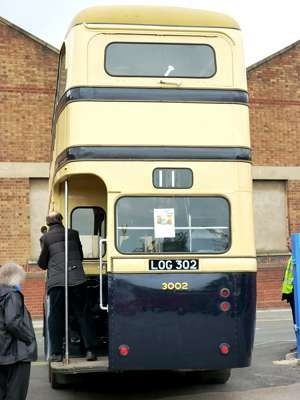 Notably, the use of ‘pop-rivets’ in place of screws, anodised aluminium replaced the usual interior wooden mouldings, a rather ugly upright rear dome, a sliding cab door (a first for BCT) and rubber window surrounds. Spending its entire life at Acocks Green garage it was not liked much by drivers being noticeably underpowered with the 5LW. Thankfully this is now in preservation. My photos were taken at the Aston Manor Museum in 2010. Interesting views, Nigel, and thank you for posting. I note that the vehicles was not liked because of its lack of power. One might have expected the balance to be similar, given that the chassis – and I suppose the body as well – had ‘lightweight’ technology. Clearly, not ‘light’ enough! Pete, Though the overall weight saving was 15 cwt, compared to the ‘standards’, I think little of this was attributed to the chassis. Added to the narrative should have been that, after bodying in the intervening 2 years, the complete vehicle was again exhibited at the Commercial Motor show of 1954. The CLG5 appeared in 1952 and had a 16ft 4ins wheelbase chassis with the Lockheed power hydraulic braking system and hydraulic gear change of the CD650. Some light weight components and the 5LW engine were employed to save weight. Only a 7ft 6ins width was offered and the electrical system was 12 volts. Despite all the cheeseparing, the chassis weight of 4 tons 6 cwt was identical with that of the ‘heavy’ wartime CWG5. The first CLG5 chassis was 18334 which was fitted with a prototype MetCam Orion body, and went to Potteries Motor Traction. "Thanks(!)" to the appallingly tinny body, the unladen weight was a mere 6tons 2cwts. The bus shown above was chassis no. 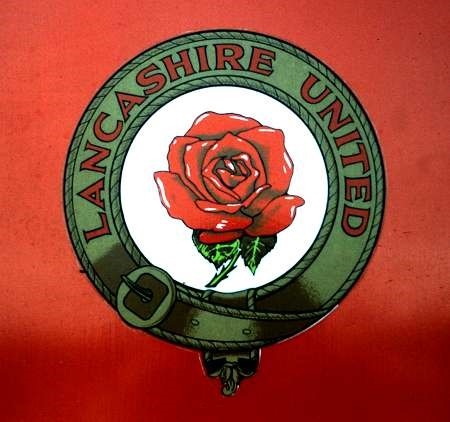 18335. Another of the very few CLG machines actually made was chassis 18337 which Daimler played around with for a few years before selling on as a vacuum braked CVG6 to Burwell & District in 1956 (see Burwell & District – Daimler CVG6 – PHP 220). I presume that chassis 18336 was another CLG5, but I cannot find a record of it. The Lockheed braking system was the Achilles Heel of the CD650, and operators stayed well clear of it. Did Birmingham 3002 have its hydraulics replaced by the standard vacuum system? The ever reliable Alan Townsin is the source of these details. I commented on 19/10/2013 that this bus was equipped with air brakes and gear change while with B&D, yet he still refers to vacuum brakes in his latest post! Yes, I did refer to vacuum brakes because that is how the bus left the Daimler factory. This is a posting about the Birmingham CLG5, and the comments concern this vehicle type, which is the form in which chassis no.18337 started life. It was converted by Daimler to CVG specification in order to find a buyer after the CLG type met with underwhelming indifference from the bus operating market. That conversion included the abandonment of pressure hydraulic braking in favour of vacuum. What Burwell & District later did with 18337, PHP 220, is outside the scope of this particular discussion, especially when its Burwell existence is already covered by a dedicated entry (which, incidentally, I initiated myself). 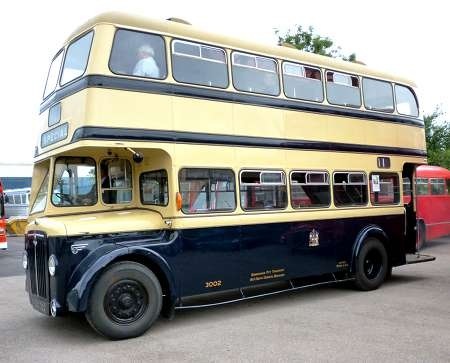 Aside from these two unique vehicles, did the ubiquitous Guy, Daimler and Crossley tin-front buses that abounded Birmingham in the 1950’s have their own makers’ gearboxes, or did they all have preselective ones, as the Daimler ones had? The Daimlers and Guys had preselective gearboxes, built I understand by Daimler and Guy respectively, though they were interchangeable. The Crossleys had manual Crossley gearboxes. Nigel Edwards says LOG 302 was at the 1954 Show. The chassis was without doubt at the 1952 Show but I can see no report of the complete vehicle being on either the Daimler or the MCCW stand at the 1954 one. Could Nigel have been mistaken? Maybe it made a brief appearance in the demo park but as PHP 220 was parading about there that would seem unlikely. It was certainly absent from public view for a lengthy period as the chassis went to MCCW in April 1953! Martin, I think if you re-read my narrative I did refer to the chassis being exhibited (chromium plated), and the body being added later! My query about Show appearances referred to the comment in your second post. There doesn’t seem to be any trade press mention of it at the 1954 Show and I had not seen it mentioned anywhere else. That was all. Referring to the mention of the Orion body type in the caption, I must point out that the PMT prototype Orion-bodied CLG5, which Roger referred to in his post, also appeared at the 1952 Commercial Motor Show. Therefore I would suggest that LOG302’s body, which was constructed later, benefitted from the development of the Orion rather than being a model for it.